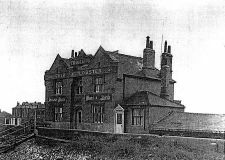 The Ship and Lobster public house was built on the river wall at Denton in the early 19th Century (1813 in Historical Walk Through Gravesend and Northfleet or 1828 in Gravesend & District Public Houses (further collection part 3) and a new one was built circa 1890. 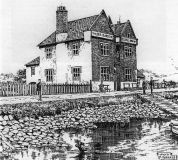 The pub is still open today and is the most easterly one on Gravesend riverside. It is also used as a turning point for river racing during local regattas. 1. Pen and ink drawing by Llwyd Roberts in Historical Walk Through Gravesend and Northfleet (p 115). 2. Photograph (b/w) in Gravesend & District Public Houses (Part 3) (p 36).